So, yesterday when my internet was down, I wrote about a dozen posts (in my head, of course) and one of them was about our vacation last week. John's brother and his family came to visit us, and we spent most of last week in Grand Lake, CO. Grand Lake is on the western side of Rocky Mountain National Park and is absolutely beautiful. It was our first time there, but definitely not our last. The last two summers we have vacationed in Estes Park, CO (on the eastern side of RMNP) and we probably would have returned there had we not had such a hard time finding a place to stay. That's what happens when you start looking only one month before you plan to arrive. Long story. Anyway, we all loved Grand Lake. The lake is beautiful, the mountains are stunning, and the town is quaint and adorable. I actually think I liked it better than Estes Park because it wasn't as crowded, and because the town is built around the lake. And because they had an ice cream shop on the boardwalk that served quite possibly the best ice cream I've ever eaten. It was dee.lish.ous! We enjoyed visiting all the shops in Grand Lake, and hanging out at the cabin, but my favorite part of the trip was time spent in Rocky Mountain National Park. I am in love with that magical place. This year, we did something I've never attempted before. We drove Trail Ridge Road from Grand Lake to Estes Park. Trail Ridge Road is the highest major highway in North America and tops out at 12,183 feet above sea level. And folks, that's some serious elevation. Especially for a girl who is quite afraid of heights. Riding in the backseat helped (thank goodness I don't get carsick) and the views were AMAZING. Most of the photos I took in the post below were taken from one of the high points along Trail Ridge Road. Beautiful, huh? The kids and their cousins were proud of me conquering my fear of heights and changed the words to "The Bear Went Over the Mountain" to "Mer went over the mountain...and we're so proud of her." They got so carried away with it that they each took turns inserting their names into the song and finishing with a verse of their own creation. Very cute and I love to witness their creativity in process! We hiked some too...and saw some beautiful scenery and some wildlife including chipmunks, a duck family, and many elk. I was really hoping to see a moose, since they live on the western side of the park and that's where we spent most of our time, but our moose hunts proved unsuccessful. Didn't see any bighorn sheep either, which would have thrilled my heart. That just means I'll have to return again and keep my heart hopeful for a future glimpse. On the way back home, we stopped in Denver for a Colorado Rockies game. My niece is a big baseball fan, and was so looking forward to the ballgame. I think we all were. Minutes after we parked, it started raining POURING rain, and it didn't stop the entire time we were in Denver. They ended up canceling the game much to our disappointment, but we made some memories we won't soon forget...envision 4 adults and 5 children holding a tarp and running underneath for 3 blocks to the stadium. Not exactly fun, and despite our best attempt we didn't stay dry, but we laughed a LOT and likely will for years to come! And we did manage to dry out...eventually. Anyway, we had a terrific time with them, and I believe someone casually mentioned visiting Yellowstone National Park next summer. Count me in! Because the kids start back so school soon, I've declared this a week of mandatory rest. I intend to go nowhere. We've stocked up on library books, and we're holing up in the house for nothing but rest and relaxation. I always think that vacation means rest, but who can rest when there is so much to see and do? So...this week is rest and recovery for us! If you had told me 10 years ago that the day would come that I could sleep in on a regular basis, I would never have believed you. I might have even laughed at you. Being a mother calls for sacrifice, but sacrificing sleep has never been easy for me. Sure, John would let me sleep in from time to time, and sometimes my children would bless me by sleeping until, oh, say, 7am. But their hungry tummies usually beckoned me from my slumber urging to be filled with all manner of healthful things. Well, about this time last year, I realized that I was sleeping in quite frequently. And John and I realized we could actually stay in bed on a Saturday morning until we felt like getting up. That, my friends, is a glorious thing. Our kids could fix a bowl of cereal, or spread cream cheese on a bagel, or make some toast WITHOUT needing help! I LIKE this stage of parenting! They let me sleep in this morning...and I'm so thankful. I needed it. They usually get up and read or play together in their rooms. We don't have cable, so the tv isn't too alluring, and they know the consequences of playing video games without parental permission, so it's actually the perfect sleeping environment for me. Nice and quiet. I realize though that my days of summer slumber are limited. School starts for us in a little over 2 weeks, and I know that I need to get my children, and myself, back into a routine of rising a little earlier each morning. But I'll think about that next week. Because for now, I prefer to see the sun once it is high in the sky. 1. Clean house Take a nap. 3. Listen to your children playing make-believe together. I'm telling you that is music to a mother's ears. 4. Compose a dozen or so posts in your head. And then not be able to post any of them. And pay no attention to the fact that when you could access the internet earlier this morning, you couldn't come up with one.single.thing. to post about. 5. Think of ways to earn extra money to buy an oh-so-cool, and oh-so-pricey iphone. Have you seen them? They are uber cool! And I'm insanely jealous of anyone who happens to own one. If you do, please don't tell me. 6. Wonder every few minutes how you ever lived without the internet. We use it for sooooo much...banking, communicating, news, weather, and a couple of dozen other things! And blogging, of course. 7. Catch up on the laundry from your vacation last week. Almost done--woo hoo! 8. Play a game with your kids. Our favorite game as of late is A-Z Jr. by Discovery Toys. It's fun and educational too. 9. Read the newspaper that got shoved aside this morning in favor of the world-wide-web. 10. Realize that the phone line exists for a reason other than to connect you to the web, and call a friend to catch up. I was unable to access the internet for a large portion of today. Not sure what was up with that other than it was a problem on my ISP's end, and is now fixed (hallelujah!) This is how I spent my time offline...all of the above, plus checking every 20 minutes or so to see if I was back online. I'm not obsessive or anything. Really. We're expecting a bit of company in a little while. John's brother and his family are planning to spend a week with us. We have some fun things planned with them, and our kids are beside themselves with joy. They only have two cousins, and these two cousins will be here, with us, for a week. Did I mention they're excited? So, I may take a little bloggy break this week and just enjoy being with our family. Last November, some of our very good friends introduced us to Nooma films. They're short films, about 10 minutes in length, in which Rob Bell, a Michigan pastor, takes something pretty ordinary and uses it to convey a spiritual truth. I watched a few Noomas with our friends, then promptly went and bought the entire set for myself. I think they're fantastic. The first Nooma I ever watched was titled "Lump". It is still my favorite of them all. In "Lump", Rob Bell tells the story of his young son getting busted for lying to his mom. His shame sends him running upstairs to his parents bedroom where he hides under the covers until his father arrives home later that afternoon to talk to him. There is so much packed into this short film, so many beautiful pictures of how God uncovers OUR shame, forgives us, restores us, and sets us back on our feet. BUT what moves me to tears each time I watch it is what Rob Bell speaks to his young son...over and over and over. He says, "There is nothing you could ever do to make me love you less." And those are the Father's words to us as well. There is nothing you could ever do to make ME love you less. Do you believe that? That there's nothing we can ever do to make God love us less? Sadly, for most of my life I believed that there were plenty of things I could do to make God love me less, and there were plenty of things I could do to make God love me more. You see, for years, I believed God to be some celestial bookkeeper. Sitting up there in heaven on his holy throne with his pencil in one hand and his tally sheet in the other. And every time Meredith did something bad (lied, gossiped, skipped church, said I would pray for someone and didn't, got angry, yelled at my kids or husband, said bad words, watched R rated movies, hated someone, worked in VBS with a sorry attitude) God made note of it and checked it off on the naughty list. And every time Meredith did something good (prayed, read my Bible, completed a Bible study, visited a "prospect", witnessed to a non-believer, taught Sunday School or Mission Friends or VBS or worked in the church nursery, listened to only Christian music, avoided R rated movies and smoking and drinking, etc) THEN God took note and checked it off on my good list. And let me tell you I was very, very good. I think if you asked most Christians they would tell you that they know they can't earn God's love. But I don't think their actions always match up. I see a lot of believers trying to make God love 'em more and keep him from loving 'em less. Almost 4 years ago, I woke up and realized that I had been living with a faulty view of God. God isn't some scorekeeper making tally marks in good and bad columns, and God isn't someone I can contol with my actions. God is a merciful father who loves me deeply and pursues me passionately and wants to speak to me intimately. Those words from that Nooma film were suddenly REALLY true for me. There was absolutely nothing I could ever do that would make God love me less. And the flip...there is nothing I can ever do that will make God love me more. I've tried to quit striving, and rest in knowing that His love is ENOUGH...always has been and always will be. And I can't lose HIS love, ever. "May your whole life become a response to the truth that you've always been loved, you are loved, and you always will be loved. And may you know, may you know deep in the depths of your soul, that there's nothing you could ever do to make him love you less. Nothing you could ever do to make him love you less. Nothing. Nothing." ---Rob Bell, "Lump"
Seriously, the schwag just keeps pouring in. Almost every day this week, John has opened up his bag and produced some sort of goodie for me. I told you about the WOW hymns cd, but let me SHOW you some of the other great cds I got this week! And my huge thanks to DP who keeps passing this stuff my way. Oooohh...I LOVE Jars of Clay, and Todd Agnew, and Barlow Girl, and the others look great too...I just haven't had time to listen to all them yet! Oh and a Chris Rice cd...love Chris Rice, but didn't get that cd in the photo. He also brought me this book. I've been reading about it on a couple of other blogs that I keep up with and looking forward to it's release...and now...my very own copy! Yea. It's a book about social justice. I started reading it last night and I LIKE IT VERY MUCH, but it's hard reading because it makes me realize my complacency and how very tightly my own eyes are closed to the injustice all around me. And...yesterday I won a Monk and Neagle cd. You really SHOULD go over to their site (click on the button below) and listen to the "Twenty-First Time", and the other 4 songs too! Amazing. I can't wait to get this cd in the mail. Their music is AWESOME, and this particular song goes hand-in-hand with the Justice in the Burbs book. I love it when God brings things all together like that for me! I've been in major cleaning mode this week. I usually resist that urge when it strikes (remember, I have a lot of sloth in me) but this week I caved and let me tell you that things are sparklin' around here. I've cleaned out every single closet, cleaned out every single kitchen cabinet and every single kitchen drawer, wiped down every single baseboard, wiped down every single slat of every single blind, and even cleaned the bathroom light fixtures. Whew...I'm tired just typing all that. I think I'm good for the next couple of years as far as a major cleaning goes. smile. If you're wondering what that is, it's a bead. And it is taped to the inside of my kitchen cabinet because there is a story to go with this particular pink bead. About this time two years ago, I remember Abbey running into the kitchen, crying hard and trying in her best 3-year-old way to tell me something. She was crying hysterically, so it took me a few minutes to figure out that she was telling me she had a bead IN HER NOSE! A BEAD IN HER NOSE! Now is probably a good time to tell you that John is the one who best deals with crisis moments around here. Vomit and blood and beads-up-the-nasal-cavity fall into his department...I'm usually not my best in such moments. And of course, he wasn't home that particular morning. Of course. So I got Abbey calmed down for a moment, collected my wits, and called the doctor's office. I answered a myriad of questions (yes, she can breathe, no, there's no blood, yes, it hurts and that's why she's crying, etc), then loaded everyone into Minnie-the-Van and headed to the doctor's office. I guess they were concerned because we didn't have to wait the usual 20 minutes to see the doctor. They herded us into a room right away and shined some very bright lights on my daughter's upturned face. The good doctor could see the bead, apparently a very good sign, and she just needed to retrieve it from Abbey's very small nose. She inserted some instrument which flared the nostril and had me hold the light AND my daughter's flailing hands (superhuman strength for the moment, I guess) and after two or three attemps she produced the lovely pink bead. That was it. The whole ordeal was over in about 40 minutes. And now we laugh about it. Every once in awhile, Abbey will notice that bead taped up to the inside of my cabinet, and will tell me that she's "never gonna stick another bead in her nose...never, ever". And I for one believe her. And maybe I should take that bead down and put it in her scrapbook, because of course I took pictures for the scrapbook, but for now, it's a reminder of everyday life in our home. There is never a dull moment...never, ever. Our family returned a little while ago from the Colorado Springs Sky Sox game. We had so much fun! John's employer sponsored an employee night at the ballpark and gave each employee 10 free tickets, a parking pass, and $10 in concession vouchers. How cool is that? I am all about free stuff. Our seats were awesome...they were box seats and not the bleachers, and because we had extra tickets, Will invited his best bud, and we invited some friends from church. I love baseball games, but I love to socialize even more, so I ended up chatting most of the time, and it was great. One of the highlights for the kids (other than the hot dogs, soda, popcorn, and the cotton candy that their father bought for them at 9:30pm and has them on a nice little sugar high at this late hour) was seeing themselves on the jumbo-tron not once but TWO times! Very cool. I tried really hard to get a picture of them on the screen, but I wasn't fast enough! Oh well. The weather was perfect...breezy and cool (notice the kids are wearing jackets!) and it was just a perfect Colorado night. I certainly hope they make this an annual event because we all had such a terrific time! John came home this evening with a little more "schwag" for me. Apparently, it's not swag, but rather schwag, and I've been mispronouncing it all this time and therefore misleading some of you. Sorry about that. Anyway, his boss collected some cds at the ICRS last week which I am now the proud owner of. The one I've been listening to all evening is WOW Hymns. It's a combination of modern and classic hymns from today's top artists, and it is phenomenal. I was eating dinner back in February with John and his boss, and we were having some sort of discussion about hymns and modern worship songs, and I made some flippant comment that I could live without hymns because they aren't really all that sacred to me. It's true that I prefer modern worship, but I really need to think before I speak so carelessly from now on, because I haven't been able to stop crying as I've listened to the words of these hymns tonight. The lyrics are timeless, and moving, and extremely sacred. Not sure what in the world I was thinking when those words fell from my lips earlier this year. It's so hard to stop at just five because I love so many of them, but these are truly my absolute favorites. As I was listening to this cd tonight, I was unprepared for the flood of memories attached to some of the hymns that are most familiar to me. I can still see Mrs. Grace Hall, a dear old saint, grinning from ear to ear every time we would sing "Grace, Grace, God's Grace" ("Grace That is Greater"). I always wondered if she was smiling so big because she knew that she was Grace and that she was God's and that song was like a little love note from Him. I can also see a little 7-year-old girl named Shelby, whose hand would shoot straight up in the air asking to sing "How Great Thou Art" every single Sunday, then singing her little 7-year-old heart out. Beautiful, beautiful, beautiful. Or when the widow of a prominent man stood up at his funeral when the organist started playing "Victory in Jesus", and the entire room stood with her, weeping, and singing, and knowing that much-loved man was with Jesus at that very moment. Or when Richard Hughes, our music minister, would make us all lift onto our tiptoes every time we sang the word lifted in "Love Lifted Me". I can't sing that song today without thinking of him and "lifting". Oh, I just have too many memories to list! Maybe I thought I could live without hymns, but I'm very sure that I was wrong. Hymns are so much a part of who I am today. What about you, friends? Do you have a favorite? Or two...or five? Her birthday started with opening presents from us when she woke up. After all that fun, her daddy took her on a breakfast date...all by herself. She loved that. When they got home from breakfast, I took her to get her ears pierced (her BIG) gift from mom and dad. They look adorable, by the way, and she was so brave...didn't even cry! And then there was her party. She had it at a paint-your-own-pottery place and she had a wonderful time with 5 of her closest friends. The girls each picked out something to paint, and the owner of the store helped Sarah make a birthday plate with her handprint in the middle and all of the guests thumbprints around the edge. A wonderful way to remember her 9th birthday! We've had a great weekend, but like I said earlier, all good things must come to an end. Happy Birthday, Sarah! We love you, sunshine! is snow. It SNOWED on Pikes Peak yesterday afternoon. I love it. The last of her snow was melting quickly and that always makes me a little sad. I just think that being snow capped makes any mountain look a bit more majestic. You know what swag is, right? If you're unfamiliar with that term, then click here to find what you've been missing out on. John just returned from the International Christian Retailers Show in Atlanta. He was there schmoozing a bunch of authors and cool people in the world of Christian retail and, while that kinda stuff wears him out, I think it sounds like SO MUCH FUN. It's fair to say I've been living vicariously through J this week. I decided after I went to San Diego with him in February, that I won't ever be accompanying him on business trips in the future. It's just not fun to be in a beautiful place without your children while your husband works non-stop. BUT, I think I might have made an exception for this trip...and mainly because of the SWAG! The past two years, the ICRS (formerly called the CBA) was in Denver. And John got to attend at the invitation of his publisher. He came home with so much swag--cds, more books that I can count (and most of them were books I actually cared to read), t-shirts, and more. So, so cool. So, you can imagine how excited I was to see what he brought home (to me) this year. Because he was working this year, he didn't have much time to walk the floor collecting stuff for me, but what he brought me was absolutely terrific. 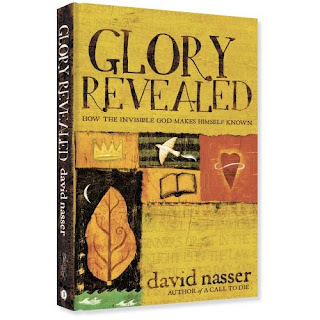 I adore my Glory Revealed cd (swag from the spring) and recently discovered that there was a Glory Revealed BOOK. And my sweet guy knew how much I wanted it and snagged one for me. So happy about that. It just got bumped to the top of my reading list! If you'd like to read more about the cd and book, click here. I can't say enough about how much I love this cd...it's all scripture, and I there is nothing sweeter than hearing my children singing God's word. Love that! He also brought me some other books...nothing great. Except maybe the The Ragamuffin Gospel Visual Edition. Some other things he collected include a bundle of greeting cards, a poster signed by Karen Kingsbury ('cause they ran out of books and made her sign posters) and some fun Jesus stickers. He brought each of the kids an Evan Almighty t-shirt. We haven't seen that movie yet, but it sure looks funny! Maybe we'll go this weekend. All jobs have their perks, I guess, but I sure am enjoying the free loot that he brings home these days! Remember a few weeks ago when I saw not one, but two bears? Well, I was just beside myself with excitement. And ever since then I've kept my eyes peeled and my fingers crossed hoping to see another one. Call me crazy, but I happen to think they're amazing creatures and am completely fascinated by them. So a couple of weekends ago, John and I were up in the mountains for our anniversary and we were hiking a really cool prayer trail and all of the sudden we start hearing some, ummm, interesting sounds. We both got really quiet and looked wide-eyed at each other. It sounded like something BIG was moving through the nearby trees. Twigs were snapping like crazy, and every couple of minutes we'd hear some low growling noises. I was beside myself with excitment. I looked at John and said, "THAT has GOT to be a bear. Oh. My. Gosh. We're gonna see ANOTHER bear. C'mon!" The noise was coming from several hundred feet away, and there was a property fence separating us from the noise, which probably explains my brazenness. We quietly inched our way up to the fence with our eyes trained in the direction of the twig-snapping and tree swayin'. My heart was racing, and I was rehearsing in my head all the things one should do if one sees a bear, and seriously, I was giddy with excitement. Finally, John saw something large and brown moving into the clearing. He pointed for me to look, and then I saw it: a long, brown tail swishing back and forth. And as I'm thinking in my head, "Wait a minute, bears don't have tails like that", I hear the growl again. Only it's not a growl, it's a MOO! It was a stinkin' COW! A COW!!! It's funny now, but I was incredibly disappointed at the time. So we were walking back to our cabin, and laughing about that cow, and just enjoying the beauty of a summer day, and all of the sudden I unintentionally stepped over a snake, and that startled the snake which jumped and scared the daylights out of me. I jumped, and screamed, did a little jig, then ran for my life for the cabin. I am terrified of snakes. John said it was only a little one. It really didn't help that he was laughing when he told me. In retrospect, it's probably good I didn't see a bear that day. I couldn't even handle the snake. ...for my daughter, Sarah, who has a birthday later this week. I tell her each night as I tuck her in that she is beautiful, she is loved, and she is good. I pray that she will always believe these things with her whole heart, that she will laugh and love and dream, and that her big, beautiful heart will always be turned towards Jesus who is completely captivated by her. ...for my friend, J, and her mom, who has cancer. They found out last week that the cancer is winning the battle for her mom's life right now. My heart is so heavy for J. I'm praying that Jesus will hold that family close today, and tomorrow, and catch every tear that falls. And asking for miraculous healing in her mother's life. ...for a girl that my children love who is getting married on Saturday. I pray that Jesus will be lord over the myriad of details that will need her attention this week, for calmess of mind and spirit, and I ask you to bless H & J, as they commit their lives to each other before You. ...for the ability to trust You when things don't make any sense. For the ability to surrender (daily). ...for safe travel for John, who returns home a little later today from a business trip. Jesus, watch over him and bring him home to safely to those who love him most. *It is always a good idea to pack extra underwear...even if you don't think you'll need them. Because you *absolutely* will need a pair should you forget to pack one. And anything that might save you a trip to Walmart is a very good thing. *Same goes for children's motrin. If you don't pack it, one of your children will wake up in the middle of the night in your hotel room with a raging headache, and their daddy will have to get dressed and drive for 10 miles just to find a convenience store to purchase some, then you'll spend 15 minutes trying to get the child with the monster headache to swallow a tablet because the only store open at 3am didn't have liquid, and this will eventually end with the child chewing the tablet (to the complete disgust of her mother), finally falling back asleep, and giving that monster headache to her parents. Better yet, just pack the whole medicine cabinet. Can't hurt. *Even when you're 99% sure that your friends' oh-so wonderful vacation condo will be available for use the week of your vacation...go ahead and have back-up accomodations...just in case. You'll save yourself about 12 hours of frustrating internet searching. *When your 10-year-old insists that you're "not going the right way to Noodles & Company" please just keep driving rather than confer with him about the "right" way to go. Really, it's just not worth it. He'll get over being wrong and you can console him with some Wisconsin mac and cheese...and maybe a Dr. Pepper. Well, I've been wanting to do this for some time, and after checking out some books at the library and realizing that I was in WAY over my head, I decided to pay someone to give my blog a make-over. I love the results! Dawn at Barefoot Blog Design created this for me, and did a wonderful job! I'm thrilled with how it turned out. So, thanks, Dawn, especially for the after hours tech support and southern girl chat! Small world, huh? My apologies if you're a mac user (like me). I couldn't see the header design until I installed Mozilla Firefox. I think it's a Safari problem. And I don't have a clue about how to fix it. Sorry. Last night we babysat for some friends of ours who have 4 children. John had a work thing, so when she called asking for a babysitter referral, I offered my services as babysitter extraordinaire. Let me assure you, I only do this for very good friends. I'm nice, but I'm not crazy! Our friends were going to be out late and they don't live close by, so we just decided to spend the night with them. Two of their children are very, very good friends with two of my children, and all of us just thought it would be the grandest thing to have a giant sleepover. Okay, John and Will weren't so hip on it, but the girls certainly were. Things went great. We played outside for a long time, ate dinner and ice cream, then watched a movie before putting all SEVEN of the kids to bed. Okay, the bedtime part maybe wasn't so much fun. At this point, the sleepover usually ceases to be fun for tired parents. They were more tired than talkative though, so they conked out fairly quickly for which I was grateful! I woke up this morning to discover that one of my children had an "accident" in the night. A bed-wetting accident. Of course that would happen at someone else's house. And of course, I hadn't packed extra underwear. Of course. Everyone got ready for church and we left a few minutes early to run by Walmart for some new underwear. One of their children was riding with us, and she asked why we weren't heading to church. Me: We have to make a stop at Walmart. Me: To buy some underwear. Me: Oh sweetie, they do in fact have underwear and everything else you could possibly need. Will (from the backseat): Yeh, everything except Jesus. We need Jesus, but Walmart doesn't have HIM. Me: You're right honey. You're right. Oh how that kid likes being right. *Update* Several of you have emailed me asking where to buy this. I've been buying it at Kroger because they keep putting it on sale, but all my grocery stores here have it. Click on the highlighted text in the paragraph below and you can put your zip code in on the "Where to Find" page. Hopefully you can find it in your area. It's made in Texas, so I'd be surprised if you can't find it down there in the south! A few months ago, I discovered Sweet Leaf Sweet Tea and it is absolutely to die for. I'm not a soda girl and I don't like usually like sweet tea because it's usually way too sweet for me, but this stuff is AMAZING. John likes the peach, and raspberry is my fave. Once you taste it, you'll be hooked! I am hopelessly addicted. These are a few of my favorite pics from yesterday. We had a very full and very fun day. Friends, food, and fireworks and highs in the 70s...what more could you ask for? We're back from our marathon road trip...and so happy to all be together again. We've got a very full day of parades, and friends, and grilled food, and fireworks. I'm also hoping to find some space in this day to rest. Here's something I wrote about the 4th of July last summer. Our plans for the day are very similar again this year...with the exception of a 7:30 am flag ceremony and pancake breakfast at our next-door-neighbor's house. I told him last night that I wasn't going to promise him we'd be there...our kids are wiped and I plan on letting them sleep. They'll be up though because apparently he's going to play Reveille on his TRUMPET at 7:30 AM SHARP! Wow. Did I mention his flag pole is just outside the girls' bedroom? I love the 4th of July. In fact, it is my favorite holiday. People look at me funny when I say that, but I'm serious! I think it has something to do with the fact that I LOVE summertime, love being outside, and love being around other people...and all those things are usually a part of our 4th celebrations. I remember as a kid waking up on the 4th of July to my dad playing John Phillips Sousa records on his old turntable. We'd usually have some sort of bar-b-que plans with friends and family, then we'd sit outside in our driveway and watch the Elks Club fireworks while being eaten alive by mosquitos. When I remember my childhood 4th of Julys, I smell smoke and Off insect repellent! Nice! My favorite 4th of July ever was in 1990--the year John and I got married. We honeymooned in Boston, and were there for July 4. We sat on the banks of the St. Charles river and listened to the Boston Pops concert and watched the most amazing fireworks display we've ever seen! It was awesome and is forever etched in my memory! This will be our third July 4th celebration in Colorado and we're making new traditions that I hope our children will remember fondly! Monument has a 4th of July parade, so we're heading down there in the morning. It is so much fun!!! It is a long parade...like 2 hours long...and there are floats, bands, firetrucks--the works. The kids love it because most of the float participants throw candy, and they scramble to collect as much as they possibly can! Politicians pass out popsicles, churches give out water bottles, and one dentist even throws toothbrushes to the crowd (we need them after all the candy!). Ours is a small town and it's doubly fun because you see so many people you know--spectators and parade participants! Tomorrow some friends from our small group at church are joining us. Should be fun for the kids and adults too. I also love the 4th of July in Colorado because it's NOT usually hot! Our high tomorrow is supposed to be 77...and we'll need to take fleece with us to the park for fireworks. Nothing muggy or buggy about this holiday and I love it! Tonight we invited some of our little neighborhood friends over to make firecracker hats for the parade tomorrow. I saw the idea in my Family Fun magazine and they are super cute. The kids went with me to Hobby Lobby this afternoon to get the stuff, and we set up two tables in our garage (it was raining) for craft-night! They turned out great and the kids will look quite festive tomorrow. We're also planning to have a little neighborhood bike parade tomorrow afternoon. We've invited some neighborhood kids to make a few loops around the block with us. Everyone is going to decorate their bike, wear their hats, and ride all together. I think it will be so much fun! The downside to all this 4th of July fun is that John has to work at REI. We were both so surprised. We never even considered that he might be scheduled to work. After being off last week, and needing some time off this week for meetings, he's kinda at their mercy...so we'll celebrate without him...and that is so hard for me. He feels so bad (and sad) about it too because he knows I love this holiday, and he likes it a lot himself. At least he'll be able to go to the park for fireworks with us. Our friend is a self-proclaimed fireworks snob and says the best show is in downtown Colorado Springs. I think we're going to trek down there even though we can see two really great displays from our backyard because it's always more fun with friends! Happy 4th of July to you! Celebrate freedom this day!!!!! Being a true homebody, I stuck close to home. I think I ventured out 4-5 times. Mostly for trivial things like a hair appointment, groceries, film developing, etc. My life is riveting, let me tell you! I did, however, watch several movies. Some I even watched in the middle of the day (gasp)! I can't begin to tell you how long it's been since I've done something that daring. I rented Catch and Release (hated it) and The Queen (hated it even more) and John and I saw Ocean's 13 (liked it) and Waitress (loved it!) and I went alone one morning to see Evening. Pure indulgence! Did very little cooking. And it was nice. If you were a fly on the wall, you would have likely heard, "How about some chips and guac for dinner, honey?" And on the nights we spent at home, we ate dinner whatever we scrounged up on the couch while watching television. Haven't done that in probably 10 years! Again, it was nice. And you know, that Raymond guy and his mother are hilarious! Slept alone in our bed all night long without a preschooler joining us in the wee hours and plastering herself all up against me. I could definitely get used to that! Saved oodles of money by not running the dishwasher everyday (think we ran it twice, and only because all of our coffee mugs were dirty), by not doing 3 loads of laundry every day (think I did 3 all week), and by not cooking three meals a day (J was lucky if I cooked ONE!). Was finally Queen of the TV Remote. I'm not a big tv girl. Okay, who am I kidding. I love tv, but this week I got to enjoy Good Morning America and one episode of Oprah and the evening news without anyone begging to turn the channel to Arthur or Dragon Tales. Went on a couple of dates with my husband, and even a weekend getaway without having to spend any money on a babysitter! Sat outside in the sun almost every day and read a book without anyone coming to the back door and needing me to come inside "right this very minute!" Scrapbooked...a lot. In fact, I completed an album--start to finish--of Abbey's preschool years. She's gonna be so pleased! Went on several hikes with John, and never heard anyone ask, "How much further?" or tell me that they couldn't.possibly.take. another.step. I admit, I enjoyed this way too much! Marveled out how clean my house stayed. If there was a mess to be found, it was because I made it. And missed my kids LIKE CRAZY! Had to call them every day just to hear their sweet voices and their I love you's, and tell them how much they were missed. I CAN'T WAIT to see them later today, and call me crazy, but I'm actually looking forward to all five of us being cooped up in Minnie-the-van for the very, very long drive back home! The first day we were without them, I was pretty lost. And sad. John was great though to help me see the time without them as a gift. It was a gift to our kids to spend time with grandparents and cousins and aunts and uncles that they don't get to see on a regular basis. It was a gift to our parents to get to spend time with our kids, and it was a gift to us to have some time to spend with each other. I like gifts, don't you? John and I just returned from a perfect weekend. Two nights in a cabin in the mountains. Lots of sunshine. A couple of great hikes. Hammocks. Cool mountain air. Aspen trees. And lots of rest and relaxation. I told him on the drive home that should he ever want to surprise me with a trip to the beaches of Mexico or Jamaica that he should quickly dismiss the idea, and take me to the mountains instead. I'm a mountain girl. That is where my heart comes alive! We were up at Potter's Inn in early May (it was 20 degrees and snowing hard) and Steve took us on an abbreviated (because it was freezing) hike of The Prayer Trail. It is a very unique trail that they created when they bought the property. There are stations along the trail where you are encouraged to sit and pray and reflect, and if Steve or Gwen don't personally walk the trail with you, they'll give you a guide they've written to help you maximize your experience. I can't say enough about it to do it justice...just know it is beautiful, and stirring, and sacred. There is one reflection spot that I just love. It is called The Cleft, and there is a huge rock there that has a little space you can sit and "be held". It is symbolic of God holding us, and it just about makes me cry every time I wedge myself into that space. Beautiful. At the end of the trail, we're about 11,000 feet above sea level and you can see for mile and miles. We were looking down on two resorvoirs (this is kinda the back side of Pikes Peak though its not in this photo) and it is just a stunning view. Pictures really don't do it justice. And I'd like this photo better if that ugly, dead tree weren't smack in the middle. Oh well. And on the way back down the mountain, I saw a beautiful Columbine...the state flower of Colorado, and just so beautiful. The perfect ending to the perfect weekend. I am so blessed!